The holy trinity of creative nonfiction, I told my students recently, is SCENE + RESEARCH + REFLECTION. Most of my students get the first scene piece: since high school, they’ve doubtless heard the mantra “show don’t tell.” Generally speaking, showing is not a problem for them, especially those who come from a fiction background. The third point of the trinity (we’ll come back to the second momentarily), reflection, is more complex and requires an intellectual leap: writers must not only recount the past, but think on the page and interpret the meaning of what they create as they do so. Thus far, the most eloquent argument I’ve found for the necessity of this process in memoir and other forms of CNF comes from Phillip Lopate in “Reflection and Retrospection: A Pedagogic Mystery Story” (Fourth Genre 7.1, 2005, pp. 143-156.) I highly recommend it — so much so that I keep foisting this essay into the hands of all my students. The question is: how do you get from SCENE to meaningful (non-navel-gazing) REFLECTION? By research I mean anything that helps further your understanding of whatever it is that you’re trying to figure out. It can be book or scholarly learning, like exploring the history of Négritude as one of my students has done or by reading Anne Sexton’s archive, as another did (I’ll return to the importance of library research shortly), but it can also be something like going on a train trip to watch how the landscape changes. It can be having a conversation with someone who knows more about a topic than you do (for a example, with a historian or a scientist) or simply standing in front of a painting in a museum. I, for one, have traveled to places where the people I’m writing about once lived: weird little Siberian villages or forgotten industrial towns in France, for example. This past summer I walked through Lithuanian forests in search of mass graves; I stood and contemplated the house that once belonged to an important “character” in my manuscript. I think of this kind of work as environmental or perhaps experiential research, but often it is this human gaze and journey and reality (everything on a human scale) that gives CNF energy, gravitas, life, and beauty. Even if you’re writing about the past, or perhaps especially if you’re doing so, revisiting sites from that past can be incredibly powerful. When I venture to these kinds of places, I spend my time gazing at a building; I collect stones and put them in my pockets to bring home; I pay attention to the insects that buzz around me; I talk to cows; I think about and note change, impermanence; I ask what remains; I watch those around me; I chat with strangers about their lives and homes; I accept every invitation to tea or a meal; I photograph everything I can; I contemplate the sky; I take tons and tons of notes. To me, all this staring, wandering, and chatting is as valuable as a trip to the library (where I spend a great deal of time too): the trick is to pay attention and record all the details along the way. But be warned: all this staring and wandering and chatting may only be the first level of research. For example, I have a student who has recently returned from a life-changing trip to Iceland, and he’s now starting to write about it. His first level of research is complete, but more work lies ahead. The second level and stage of research might mean his going to the library and reading tons about sagas and Icelandic history until this writer has mastered his subject enough to distill and retell with energy and spontaneity. Once this learning starts to belong to him in some way (as family history does) — that is, once he’s achieved a kind of deep learning — then he’ll likely find organic ways of engaging with the necessary literary-historical material and, in turn, of teaching his reader. When I’m talking about this process of deep learning, I tend to call it “digestion.” You have to let the facts and history work their through you, I say (though I try not to follow the metaphor through to its logical ends, ahem). The research has to become part of you so that you can put it back out onto the page and into the world in a form that won’t fight the story that you’re trying to tell. This, I believe, is the most difficult aspect of writing good CNF: figuring out how to teach the reader; how to give enough background history, facts, and evidence but without deadening your text. Once you do the research, you reflect and figure out what the research tells you about the primary journey you’re on: for one of my students, the question is what Anne Sexton’s archives can teach her about a mother’s death. For another, the question is what the slave ships of Nantes have to do with her search for home and belonging. Research will help you interpret the scenes you write and details you put to paper and it will help you get closer to an answer to whatever question drives you and makes your text vibrate. It will deepen your text and make it larger than your sad little story of loss (I don’t mean to minimize, not at all; we all have these). Most CNF undulates in some way between the big and the small. The writer’s sad little story is the small of the piece: all our mothers will die one day. The reflection and understanding that grows out of research (in whatever form it might take) will constitute the large. It is in going beyond ourselves, beyond our own smallness that we can learn something and then give that lesson over to a reader — what is the big thing that I can learn from my smallness? That’s the great question, gift, challenge, and mystery of CNF. We Are Here: Memories of the Lithuanian Holocaust. University of Nebraska Press, 2012. 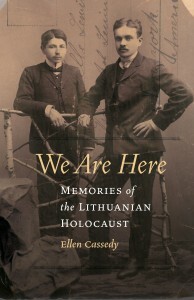 We Are Here: Memories of the Lithuanian Holocaust tells the story of Ellen Cassedy’s personal journey into the Jewish heartland of Lithuania – the land of her Jewish forebears – and then expands into an exploration of how Lithuania today is engaging with its complex 20th-century history. Probing the terrain of memory and moral dilemmas, the book shines a spotlight on fragile efforts toward mutual understanding and carries a cautious message of hope. Ellen Cassedy has explored the world of the Lithuanian Holocaust for ten years. 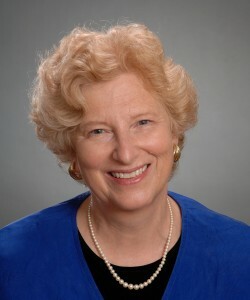 She is a former columnist for the Philadelphia Daily News. Her articles have appeared in Huffington Post, Haaretz, Jewish Journal, Hadassah, The Jewish Forward, Jewish Telegraphic Agency, Lilith, Bridges, Utne Reader, Polin, and Shofar: An Interdisciplinary Journal of Jewish Studies. She is a frequent speaker about Jewish and Lithuanian issues, and a regular contributor to VilNews, the international web magazine based in Vilnius, Lithuania. She lives near Washington, DC. Julija Šukys: The frame for your book is a trip to Vilnius to study Yiddish at a well-known summer program there. Tell me a little bit about your relationship to the Yiddish language. How much Yiddish did you speak or understand before arriving in Vilnius? How did your relationship to the language change over the summer? How much Yiddish did you encounter in Lithuania? Ellen Cassedy: My mother used to sprinkle Yiddish words into conversation like a spice. At the window on a rainy day: “A pliukhe! (a downpour. )” In the kitchen: “Hand me that shisl (bowl).” On the telephone: “The woman’s a makhsheyfe (a witch).” After she died, I missed those homey syllables. I began studying Yiddish as a kind of memorial to her, a way to hold on to my Jewish heritage. By the time I arrived at the summer program run by the Vilnius Yiddish Institute, I’d progressed far enough to be placed in the second-to-highest level – where I held on by my fingernails! Spending several hours a day in class and doing hours of homework every night was a mekhaye – a great pleasure. 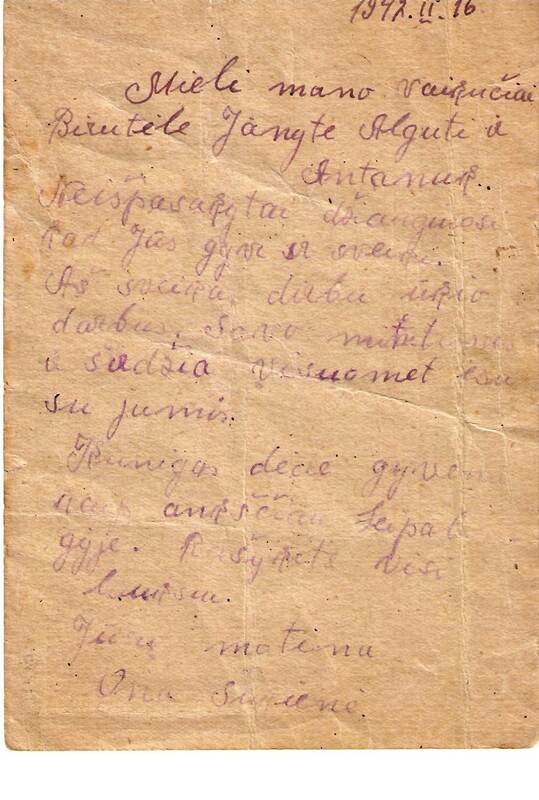 Within a few weeks, I became able to conduct interviews in Yiddish – with a Holocaust survivor from my ancestral town of Rokiškis, with the leader of the Jewish community in the city of Šiauliai, where my family members had been imprisoned in the Shavl ghetto. And occasionally I’d encounter a Yiddish-speaker on the beautiful streets of the Old City in Vilnius. The Yiddish scenes that I weave through the book serve as resting places for both me and the reader – places of laughter and love. The central focus of this book is the Holocaust bystander. You seek to consider the role of the bystander in a nuanced way and struggle to understand what it meant to be a non-Jewish witness to the Holocaust. In the end you arrive at a kind of reconciliation or entente in your understanding of the opposing forces and tragedies that were at play in Lithuania during World War II. Tell me a little bit about how you came to take this path. On the brink of my journey to Lithuania, I learned there was an old man in my ancestral town who wanted to speak with a Jew before he died. In 1941, when he was 17, he watched as the Jews of the Rokiškis region were rounded up and marched off into the forest to be shot. Those memories had tormented him all his life. He wanted to tell what he knew, and he wanted a Jew to hear his tale. Would I be that Jew? The time I spent with this haunted witness – and with numerous other Lithuanians who shared with me their family stories of the Holocaust – showed me that “bystanders” are not an undifferentiated mass. We need to look closely enough to understand each person as an individual. And our goal must be to create the kind of society where it is easier to stand up than to stand by. I don’t think I’m giving too much away by saying that you discover that your uncle was a member of the ghetto police force in the Shavl Ghetto. The ghetto police forces were and are, of course, extremely problematic – they are both victims and oppressors. You cite Primo Levi’s term “the gray zone” to describe the moral space that people like Efroyim Gens (head of the Shavl Ghetto Police) and his brother Jakob Gens (head of the Vilna Ghetto Police) inhabit. To what extent should we, from our perspective, suspend our judgment of those in the gray zone? What conclusions have you come to about people like your uncle and the Genses? Do your uncle and the Genses belong in the same category? I don’t think I’ll ever stop wondering about my uncle and the complex truths he embodies. I’m less interested than I used to be in assigning people to one category or another. Maybe, when it comes to people like my uncle and the Genses (who had more power than my uncle did, but still faced inhuman and impossible choices), the answers are less important than the questions we continue to ask ourselves. Maybe it’s the moral attention we pay that will help to prevent future genocides. Timothy Snyder’s book Bloodlands caused a firestorm when it appeared in 2010, because some historians and other readers considered that he equated Nazi crimes with Stalinist ones, thereby minimizing or excusing the former. He was accused of “Holocaust obfuscation,” among other things. By contrast, you, like Snyder, seem to view Nazism and Stalinism and the ways in which those eras are remembered in Lithuania as interconnected. Wartime and postwar Lithuania itself is portrayed in your book as a kind of gray zone. Is this a fair characterization of your position? Could you expand? I learned a great deal from Bloodlands, and I recommend it to anyone interested in the cataclysms of the 20th century. To examine both Nazi and Stalinist crimes, to explore the connections – that’s a basic job for a historian. The term “gray zone” doesn’t mean we turn away from morality. When we see things going wrong, we must speak up loud and clear. Bloodlands can help us do that. In Lithuania, it was hard for me to open up to “the Other,” to hold in my head the reality of non-Jewish suffering alongside Jewish suffering. Hard – but essential, especially for those of us in the successor generations. Can we honor our diverse heritages without perpetuating the fears and hatreds of the past? Can we appeal to one another not as victims, bystanders, or collaborators, but as fellow beings with the capacity for moral choice? Those are the questions I hope my readers will ask themselves. My final question is about the Lithuanian language and the ways in which you had to use mediators to “access” Lithuanian narratives and memories of the Holocaust. With the exception of Yiddish speakers, you interviewed most of your Lithuanian contacts in English or through translators, and employed third-party intervention to collect and work through archival sources. What risks does working through mediators in this way bring with it? How do you account for or deal with what necessarily gets lost, censored or simplified in translation? By the time I left Lithuania, I had a Lithuanian vocabulary of about 60 words – pitiful! I don’t know Russian, German, or Hebrew, either –all of which came into play in the writing of my book. But I’ve always been intrigued by what happens when people from different cultures, using different languages, make the effort to communicate. My experiences with translators and interpreters turned out to be utterly fascinating encounters in themselves. I make sure the reader gets to meet Regina, Hirsh, Emil, Natasha, and others who helped me make sense of what I was seeing and hearing. When you think about it, aren’t we always mediating, always translating – no matter who we’re talking to, no matter what languages are involved? Reaching out and attempting to understand, even when it’s a challenge – in the end, that’s exactly what We Are Here is about. My husband, son and I have just arrived in Malta. Sean is on sabbatical this year, so, many months ago we started casting about for destinations we could afford on a reduced salary for 8 months. I wanted to go somewhere warm and sunny. Sean wanted lots of room in the house so that both of us had writing spaces. Sebastian needed to go to school. And, frankly, we all could use a change of pace and the healing presence of the sea. We found a lovely house in a village on the sleepy island of Gozo (Malta’s sister island). So, here we are. 1. The crystal blue water at the beach. 2. The lizards that run upside-down along the terrace ceiling. 3. The fishnets that hang in our doorways to keep flies out of the house. 4. The sounds of roosters and cicadas that wake us each morning, and the goats that amble by our front door every night. 5. The statues of saints and of the Virgin Mary that protect houses and traffic roundabouts. 7. The honey-coloured limestone used to build all the homes here, and the way its dust makes our hair stiff by the end of the day. 8. The way everyone sits out in front of their houses and mills in village streets in early evenings. 9. 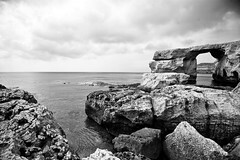 The sound of Maltese that is a mix of Arabic, Italian, and other languages. The Right to Write, or Whose Story is This Anyway? I’ve finally started writing my new book, Siberian Time, in earnest. It will tell the story of my grandmother’s 17-year exile to Siberia. Inevitably, too, it will tell stories about my family members: my father, his sisters, my cousins, my grandfather. Because my chosen forms are the personal essay and creative nonfiction, I almost always appear in my work. Often too, there are traces of my husband and son, simply because they’re always around, and life with them colours everything I write and do. But until now, the prism of my life has been a tool for bringing someone else’s story into focus. My life, and that of my family, have never been at the centre of a project. 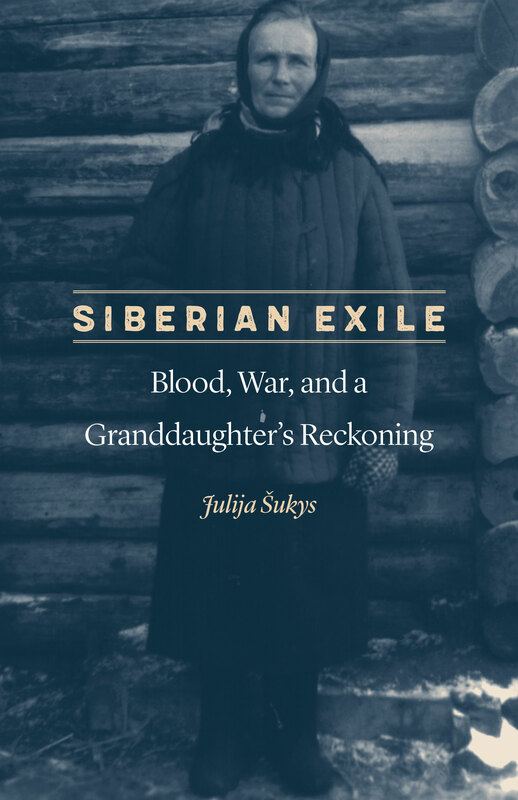 So, I’ve just finished writing a lengthy essay about my 2010 trip to Siberia, when I travelled for four days by train across Russia to find the village where my grandmother was forcibly exiled. My cousin Darius came with me, and turned out to be the perfect companion. Before leaving, I warned him (with a laugh, but nevertheless deadly serious) that he would inevitably end up in my book, and he assured me that this was cool with him. Little did he suspect that my first piece of real writing stemming from our trip would be all about him. For a long time I blamed the wound of my grandmother’s exile for the premature deaths of two of her three children. My father died suddenly of a heart attack when I was eighteen, and his sister (Darius’s mother) died of cancer about four years later. But only after returning from Siberia did I start really to wonder how my grandmother herself survived. 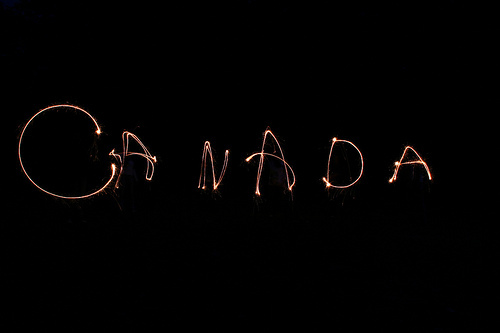 Though it wasn’t so much about Siberia that I wondered, but Canada. My grandmother arrived in this country in 1966, reuniting with her children after 24 years of separation. The six-year-old boy she’d left in Lithuania (my father) was balding, married and approaching middle age the next time she saw him. The piece I’ve just finished asks the question: How do you survive when faced with incontrovertible evidence that life has passed you by? My answer: my cousin Darius. I explore the idea that he was her second chance. 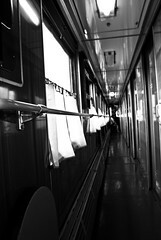 My essay (currently titled “Trans-Siberia: Like Birds Returning Home”) narrates some painful memories that my cousin, who was in large part raised by our grandmother, shared with me on the train to Siberia. It also tells of our trip and of what we learned. Once I finished, I was pleased with my resulting text, but worried that I’d overstepped a line of privacy. The memories I used in my writing were not mine, and I felt I needed to ask permission before putting them out in the world. So, I braced myself, and sent the text to Darius. His response has been beyond encouraging. My cousin wisely counsels me to continue on, not to censor myself, and to be fearless. Nonetheless, I still feel a bit of uneasiness, and maybe that’s not so bad. I recently reviewed Stephen Elliott’s memoir The Adderall Diaries. In it he states that he doesn’t seek approval from those he writes about. And though I absolutely understand why he wouldn’t, and don’t disapprove, I nonetheless continue to feel a responsibility to those whose memories I use. I’m not sure how much vetting I’m prepared to invite or allow as the book progresses. You can’t please everyone, true, but to what extent are we answerable to those whose lives intersect with what we write? For me, this remains an urgent question. 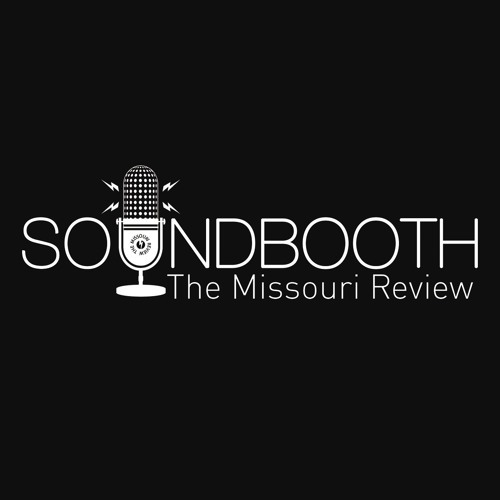 I’d love to hear about others’ experiences in this area. Have you written something using others’ memories or experiences? Did you allow for vetting or approval? Did you suffer a backlash? What is the biographer’s or memoirist’s responsibility to the lives she borrows for her work? La varicelle, as it’s called around these parts, or chicken pox to us English speakers. Our doctor confirmed it this morning. Despite my son’s vaccine against it, the virus has taken hold, though perhaps not as firmly as it might have otherwise. As I write, my red-spotted boy colours beside me with his new markers, picked up at the pharmacy with his prescription. There’s nothing like sickness to make you appreciate your good health and the time you have to work under more normal circumstances. The coughing and sneezing of the past few weeks have been a good reminder to me that, when the body fails, a life of the mind is hard to sustain. If I want my mind to function, I have to honour my body. I’ve always had a bad back, and if I write for too long without taking the time to go to my yoga classes, it isn’t long before the pain takes over and saps all my attention. I learned this the hard way some ten years ago, when I sat at my desk from dawn till dusk, seven days a week, five weeks in a row, to finish my dissertation. By the end of it, I could barely walk. Poor me. But recently, I’ve been trying to think about my back pain differently. I’ve started thinking of it as a gift. I inherited my bad back from my father, who in turn got it from his mother. And when I speak to my cousins and aunts, we are all surprised hear that we have the same issue. Back pain binds us together in the present, but it also gives us a link to the past – to the grandmother who connects us all, and who inevitably had a whole different relationship to pain. The fact is that my back pain is but a shadow of what my grandmother went through. Whereas I have the luxury of taking a break and heading to yoga class when I feel my muscles acting up, my grandmother had no such choice. Whereas I have the time to think about this pain, to manage it, and to turn it into a text if I can find the right words, my grandmother had to grit her teeth and keep going. There were calves to feed, cows to milk, logs to chop, and there was no rest for her aching back. On the farm where she worked (for nothing), in a place she had been exiled to against her will, back pain would have meant something very different to her: pure suffering and an external manifestation of what must have been happening inside her. This coming weekend (as long as the pox allow – our doctor is hopeful), my son and I will travel to meet with my cousins, their children, and my aunt. Darius, who travelled with me to Siberia to find my grandmother’s village, will come up from San Francisco to meet us on his holiday weekend, and has planned a traditional American Thanksgiving dinner for the occasion. As I raise my glass to toast the harvest and the gathering of my grandmother’s children, grandchildren and great-grandchildren for the purpose of hearing stories about and looking at pictures of the place she was exiled, I will remember my minor annoyances. And I will be thankful for the pox and the pain. Because my trials are so small, I know I am blessed. In this troublesome back of mine, I will always carry of piece of my grandmother. Pictured above is one of my most cherished possessions. 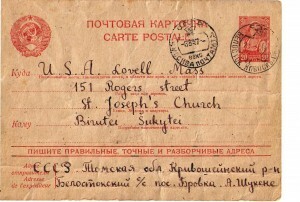 It’s a 1947 postcard sent from my grandmother in Siberia, addressed to her husband and children. It was sent to a town in Massachusetts where we had relatives, though at the time my grandfather and his kids (my father among them) were living in the UK. My grandmother wrote their church’s address from memory, I think, and sent it off as a kind of Hail Mary attempt to reach her loved ones. Amazingly, it made its way out of Stalinist Russia and into the hands of distant cousins in the US. From there, the card found its addressees: my father, my two aunts and grandfather. 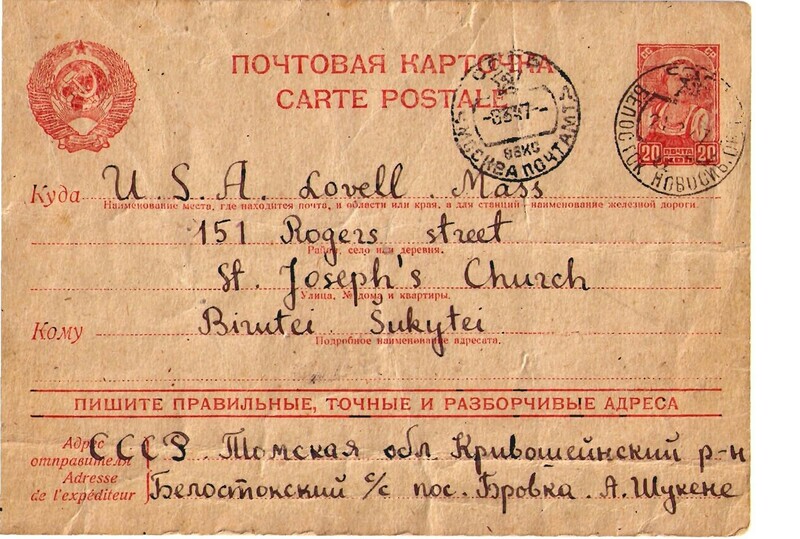 It was the only moment of communication my grandmother had with her children between 1941 and 1955, when regular correspondence between Siberia and the West became possible. It made me indescribably happy to learn that you were alive and well. I’m healthy, I work on a farm. In my thoughts and in my heart I am always with you. The priest, my uncle, is still alive and lives in Liepalingis [Lithuania], as before. Write to me, all. I await your letters. After weeks of working my way through my travel notes from Siberia, I’m now back to my archives: reading my grandmother’s letters, and travelling in my mind across languages, time, space. 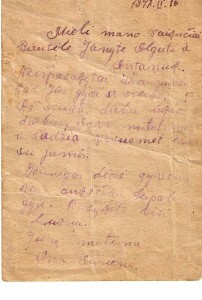 My grandmother wrote letters to her children from Siberia from 1955 to 1958, then from Soviet Lithuania from 1958 to 1965, when she joined her family in Canada. 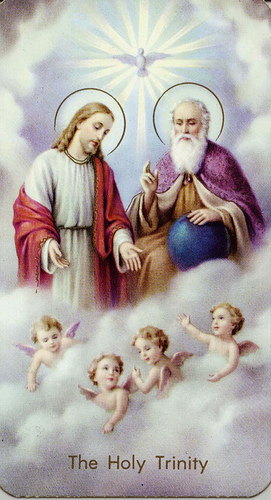 The above card marks the first step in their long process of return to one another. For me, now, it marks the beginning of my next stage of writing. While working through my Siberian travel notebook over the past few weeks, I wrote a great deal in a very short span of time. It was going so well that I didn’t dare stop, question, or even re-read too much. In fact, I was working so fast that I became uneasy, and started bracing myself for the other shoe to drop. Well, crisis averted. With the complex tasks of weaving past with present and of melding my life with that of another back in my sights again, the familiar feeling of wading through mud has returned. Writing hurts again and the book resists. All is well with the world in this regard. Two cousins and I spent fourteen days travelling from Lithuania to Siberia’s Tomsk region, in search of the neighbouring villages of Brovka and Bialystok where my grandmother lived in forced exile and worked on a collective farm for seventeen years (for a time she lived in one village, then in the other). We found both villages (Bialystok still very much alive; Brovka now defunct), plus so much more along the way. Siberia surprised me at every turn. It was both gentler and at times more desperate than I’d imagined. The journey was worth every minute and every kopeck. In Tomsk we marvelled at stilettoed women strolling through the city with their babies, and were awed by the beauty of Tomsk’s Catholic Church perched up on the city’s one hill. The nearby Sisters of Charity welcomed us warmly and glowed with joy, all the while telling harrowing drunk tank tales. Six nuns minister to the city’s alcoholics. We had many local companions and guides without whom the journey from Tomsk north to Bialystok would have been impossible: there was Vasily, the museum director, born and raised in the village; Svetlana, our guardian angel, daughter of a Lithuanian exile, and generally the coolest Siberian you’ll ever meet; 79-year-old Anton who took us into his house and fed us from his kitchen garden; Dusya, Anna and Nina, who shared their memories of our grandmother; and Maria who showed us hospitality with a potato and egg fry that we ate straight out of the skillet plonked down in the centre of the table, Siberian-style. All this, plus my impressions of Moscow suffocated by wildfire smoke, our deportation from Belarus and resulting mad-dash through Copenhagen’s airport in a race to catch up to our train, and of the still Siberian landscape under the blue shutters and fences of Russian villages, will unpack and reformulate itself into a book over the next year or so. I’ll share what I can as I work. To all those who helped along the way: Spasibo bolshoe. Ačiū.